When I first discovered about blogs, I had no idea how much I was into blog/blogging. I kept journals since I was 13; when I first separated from my family, I wrote everything in it - the homesick-ness, the friendships, the scary seniors, the unfamiliar environment. Up till I was ready to take my SPM, my journals and I were inseparable. Then in AAJ I discovered that you can write online journals too. I began reading my close friends' blogs (most of them were in Friendster, so mostly Friendster's blogs) and found them very interesting. But one of the blogs I loved the most was my friend's who was my ex-schoolmate in SSP. We weren't that close but we weren't strangers either. I remember when I first started blogging, her blog was one of the main contributors - I found that blogging can be so fun. In her blog she usually wrote about her style, her life and her boyfriend - all of which I could relate so well. I always thought she and her boyfriend is the perfect couple - they were together since forever, and from her posts you would know how much love these two shared. Of course, in relationships there aren't always sunshine and rainbows - they hit a rough patch. But they managed to go through that eventually, which I respected her the most for being the strong girl that she is. I, for one, can't even imagine what I'd do if I were in her shoes. And a few days ago, thanks to Facebook I found out that she's engaged :) She's no longer blogging (and I miss her blog! Sigh) so I don't know much about what's going on with her life anymore (blogging can really expose you to the world. Shaites.) Thank God there's Facebook! On another note, I'd like to present to you the favorite blog of the month - http://dianarikasari.blogspot.com/ . If you haven't heard of her, she's a fashion blogger from Indonesia and her blog is awesome! Not only because she has a great style but she's also very down to earth; something that sets her apart from others. Besides fashion she also blogs about her thoughts too; which are always my favorites. Thanks to a dear friend for recommending her blog (I think reader sounds..I don't know, weird) a while ago. Go check out her blog! 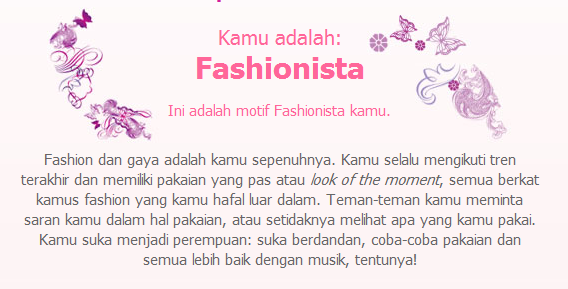 i got "little miss perfect"
im no near "fashionista" jugak haha!